Since I blew out just the candles that are showing on the dice, I get to peek at TWO presents, and hopefully they're what I want for my birthday! It’s the day of the big party. You’ve done your cheek-muscle exercises. You’ve prepared your speeches. The streamers are up, the pointy hats are ready, and you’re ready for the music to begin. And when the song stops? That’s when the magic begins. All of the candles will go out in one breath, and you’ll get the gifts of your dreams. At least, in a perfect world, that’s what will happen. But regardless of the outcome, you are determined to have a happy party. 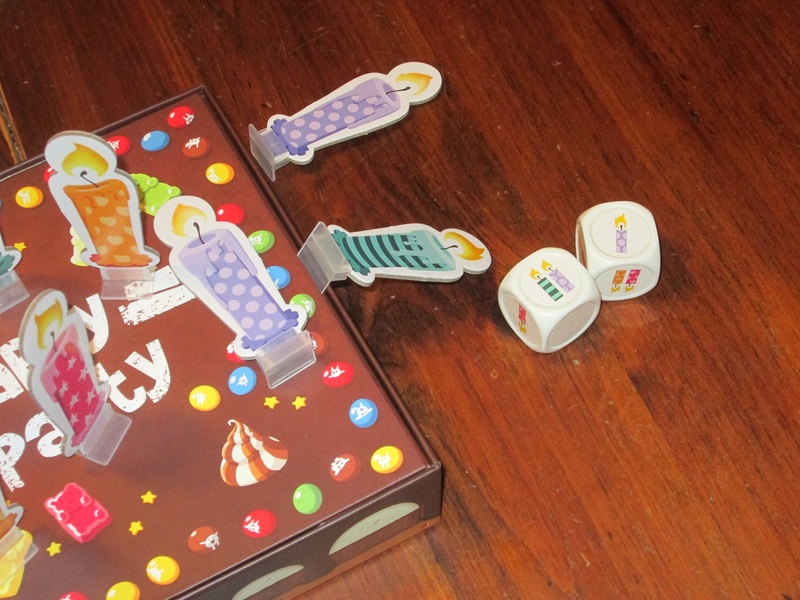 Happy Party is a dexterity/memory game for two to four players. Players roll dice and blow out cake candles to collect presents for their wish list. The first player to complete his or her wish list is the winner. Happy Party set up for two. To begin, each player receives a wish list. 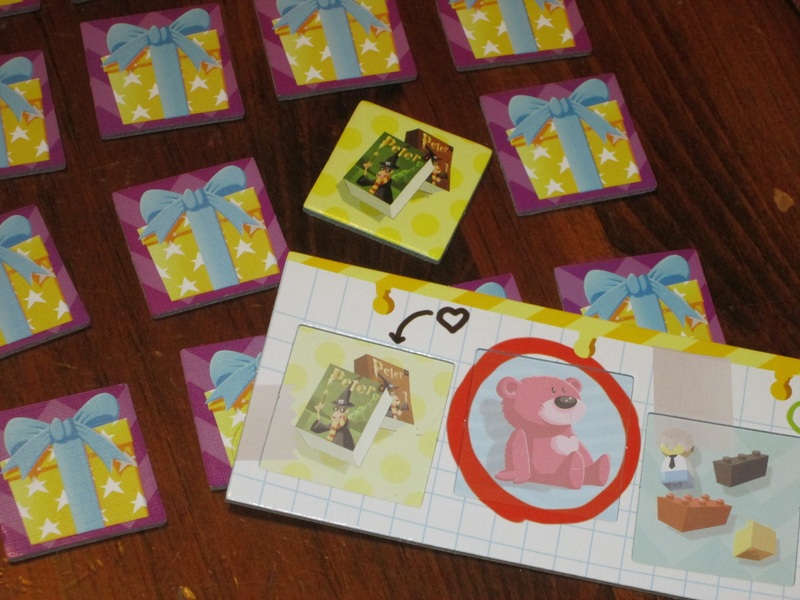 The candles are placed on top of the cake (the box), and the sixteen presents are randomized and placed in a 4×4 grid. The game ends when one player completes his or her wish list. That player wins. The gifts you’re hoping for in Happy Party. Happy Birthday to Me, or It’s My Party and I’ll Cry If I Want To? 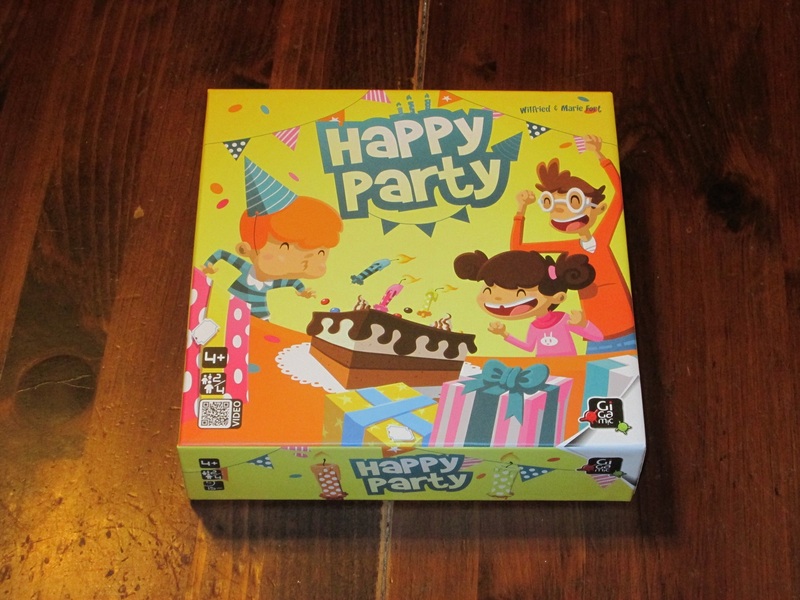 Happy Party is a children’s game, full stop. It’s not something you will pull out with your gamer friends, or even with older kids, and it’s the kind of game that is a fun challenge for children but not necessarily for you. But it is nigh perfect for young gamers, at least if my son is any indication. 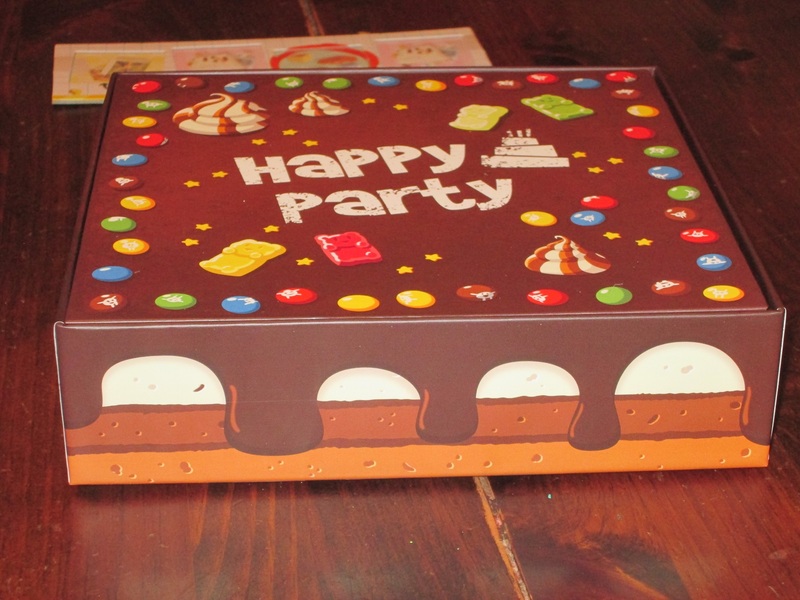 The box doubles as the playing area and is designed to look like a cake. This is a nice touch. 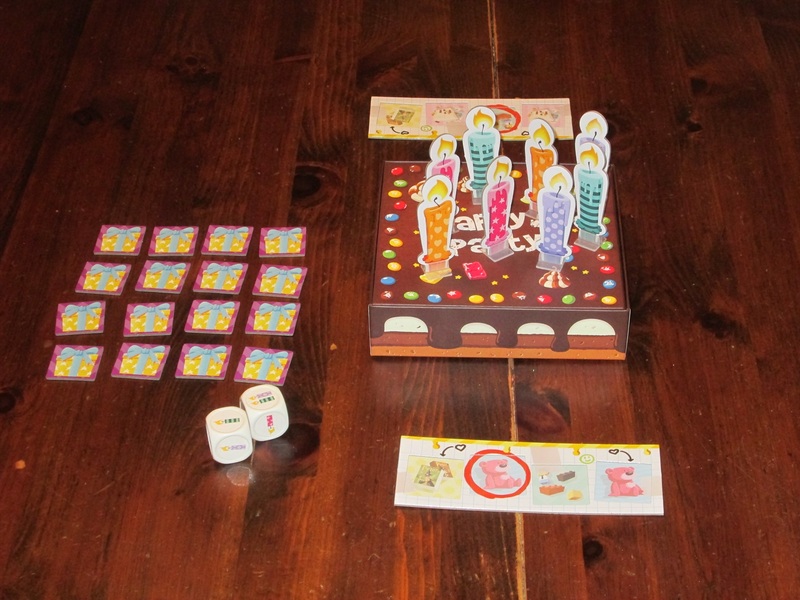 My son is four years old, which is the start range for Happy Party, and the game is ideally suited for him: he can complete the tasks in the game, but they push him a little more than some of the other games he plays. 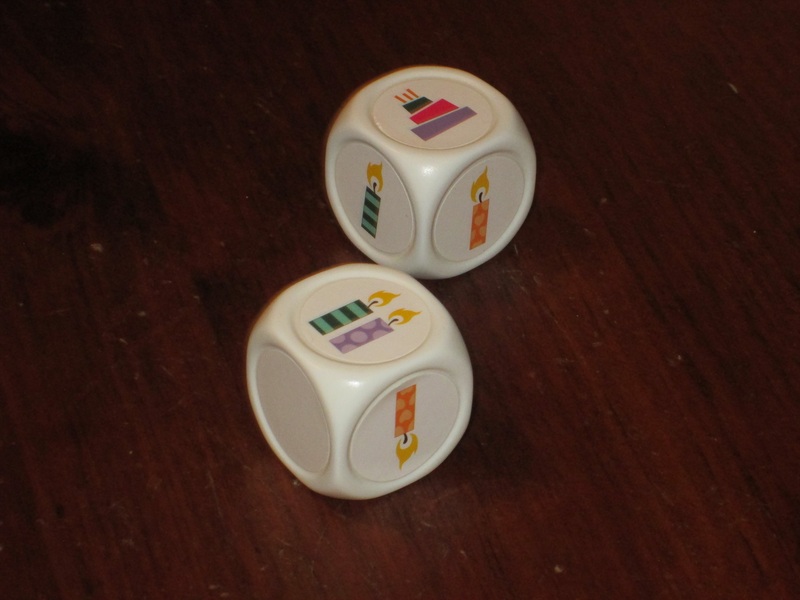 The dice in Happy Party are quite large and hefty. They are almost more blocks than dice. They’re stickered, but these are good quality. First of all, he loves the theme. The first time he saw the game, he got a huge grin on his face, and in that first game, before each player’s turn, he insisted that we sing “Happy Birthday” to get in the mood. It took some doing to convince him that he should only blow out the candles on the dice and no more, but in subsequent games, he’s been more on task in that regard (but it’s always exciting to him when he rolls the cake). Since I blew out just the candles that are showing on the dice, I get to peek at TWO presents, and hopefully they’re what I want for my birthday! The challenge of the game, for him, comes with the memory aspect of turning over presents. Once you blow out the requisite candles, you turn over presents, hoping to match gifts on your wishlist. His tendency is to turn the same presents over again and again, hoping for a different result, but this was an opportunity for me to walk him through what he should do. “What’s on the other side of that present?” I asked. That conversation probably sounds painful if you are talking to an adult, but it’s a good way to engage a four-year-old in very basic logic. And for that, I’m grateful. That book is just what I need. The components in Happy Party are very nice. The candles are standees, but they’re standees that stand well on their own yet can be blown over with a little effort. 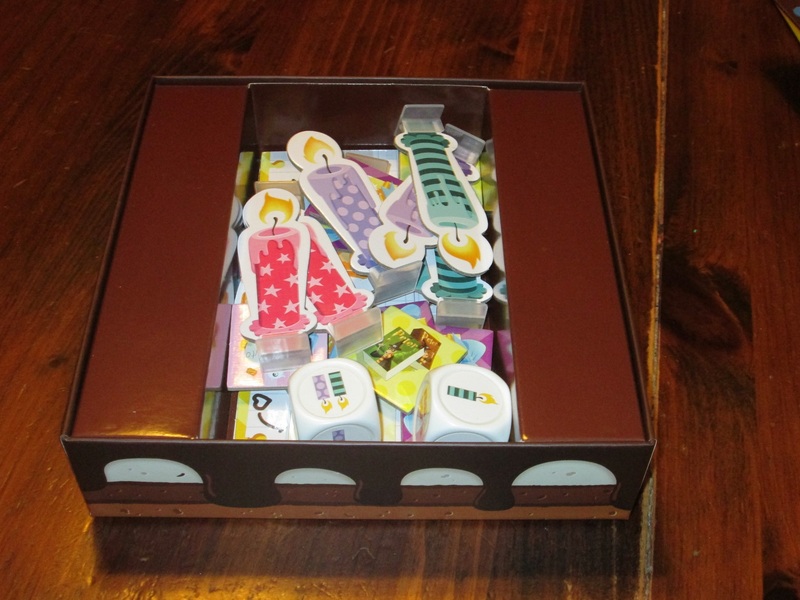 The box and board look like a cake when set up, which enhances the flavor of the game (and gets my son super excited). 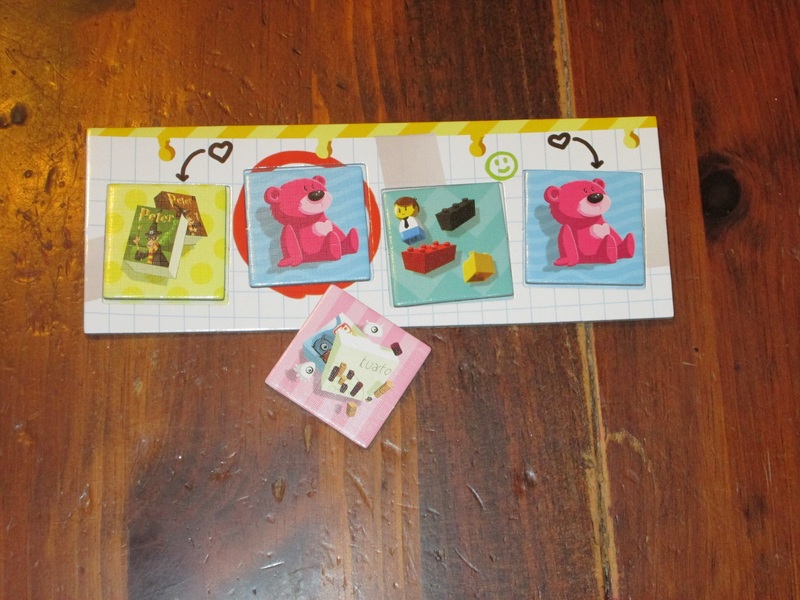 The present tiles and wish lists are on thick cardboard, and the dice are chunky and have a great heft for little hands. I have no complaints here. 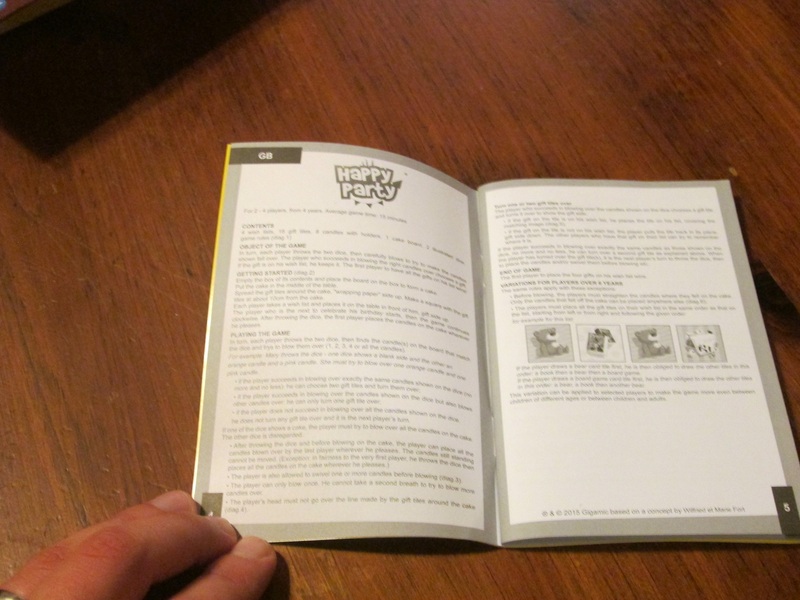 The rule book is thick, but that’s because several languages are included. The English rules are here, a spare two pages. The game is simple, so I can imagine some kids getting bored with it if they’re used to meatier fare, but I expect that the central conceit of the game–blowing out candles and getting presents–will make up for any rules boredom, at least for younger kids. And there are advanced rules (which I didn’t try) that make the game a little more difficult for older kids. My two-year-old daughter, who I don’t think is quite ready for this game, was interested when she saw my son and me play it, which I take to be a good sign. My son and I usually play two or three games at a go, and each game lasts a satisfying ten or so minutes. Since each game is short, it’s easy to tailor the playtime to the attention of your child. The insert for Happy Party. Happy Party will not set the gamer world on fire, but it’s not intended to do that. It’s an ideal game for its audience: small children. I love seeing the joy my son has when he rolls the dice, blows over the candles, and gets to claim presents for his wishlist. In fact, winning and losing is secondary to the fun had in that (and in singing “Happy Birthday” incessantly). The pieces fit the game and work well for what they’re supposed to do. And I like that the game offers opportunities for explaining logical choices in a nonthreatening environment. This is a game I’m happy to serve up for my son and one he’s happy to play, which is a gift indeed. iSlaytheDragon would like to thank Gigamic for providing us with a copy of Happy Party for review.